Among people it is said that the Newfoundland dog breed is related to the Labrador, however that is not entirely true. This breed of dogs was already in St John's in Newfoundland 500 odd years before the Labrador. The Labrador dog is descended from a dog called the St. John's Water Dog and selective pairing with The Newfoundland. In the initial days of this breed before they were called Labs they were known as "the lesser Newfoundland dog”. The name Labrador was given to them after they become popular for their amusing characteristics. The Newfoundland is a strong, enormous dog. The head is broad and heavy with a slight bend. The neck and back are strong. The nose is generally black except on bronze-colored dogs, which have brown noses. The teeth meet in a level or scissors bite. The deep-set, dark brown eyes are relatively small and spaced wide apart. The legs are well muscled, straight and parallel. The cat-like feet are webbed. The double coat is flat and water-resistant. The oily outer coat is coarse and moderately long, either straight or wavy. The undercoat is oily, dense, and soft. 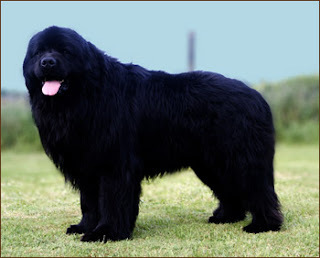 The Newfoundland is a dog with an magnificent, cool, fearless, generous, peaceable and wise. A calm, patient dog, who is mild with guests, and obedient with its master. They are very devoted, loyal and trustworthy. Due to huge body it moves rather slowly. They don’t bark much but are brave when needed. They love to swim, and will lay in water if they get the chance. They are difficult to train, the trainer should be calm and patient with this breed of dogs. In order to achieve a well balanced dog one must be calm, but firm, confident and consistent with the dog.Will do okay in an apartment if sufficiently exercised. They are relatively inactive indoors and a small yard is sufficient. This gentle giant is quite content to be inactive around the house, but they still need to be taken on a daily walk, While out on the walk the dog must be made to obey beside or behind the person holding the lead. Grooming should be done daily to weekly brushing of the thick, coarse, double coat with a hard brush is must. The undercoat is shed twice a year by this breed in the spring and fall and extra care is required at these times. Avoid bathing unless mandatory. The Newfoundland breed of dogs is generally a healthy breed but They are prone to hip dysplasia and heart disease. This is a big breed and generally lazy it also is prone to excessive weight gain, it is essential that the diet of the Newfoundland dog breed is controlled and it is given exercise to maintain its weight to a healthy level. This dog breed lives for between 9-15 years with its average lifespan being 10 years. The health of your dog is your responsibility keep it healthy and it will be a wonderful companion, if you notice anything unusual with the health of your dog get it checked by a veterinarian to rule out any dog diseases that might be affecting it.